Fasching, as it’s known in Bavaria, is crazy and a fun time to be in Germany. Fasching is also known as Karneval or Fastnacht in other parts of Germany. It officially kicked off the Karneval season Nov. 11 at 11:11 a.m. with pre-Lenten festivities. During Germany’s carnival season, people wear masks and attempt to drive away winter’s evil spirits and bitter weather. The celebrations — some of Germany’s most colorful — closely resemble Mardi Gras festivities in the United States. The northern region of Germany, particularly the Rhineland area, is the hub for German’s carnival season, with local parties and parades spring up all over the country until the season closes the night before Ash Wednesday. Fasching parades pop up all over Germany during Karneval season. In smaller cities, these parades are casual, with small groups dressing up in a special, often political, themes. It’s a great time to roast politicians and other major public figures. 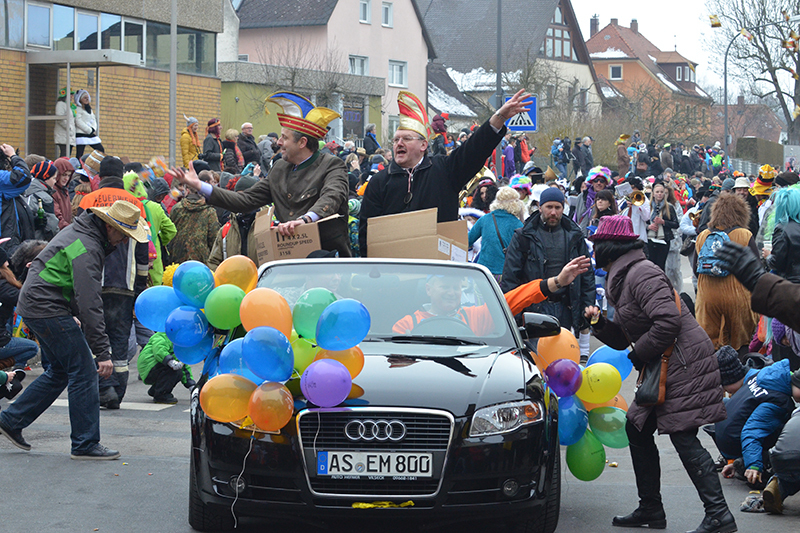 In most situations, the whole city and neighboring villages take to the streets and celebrate Fasching together. In bigger cities in the Rhineland, such as Cologne, professional carnival groups work all year long for this particular day. Thousands of people flood the streets of these events and they are broadcast live on TV. This is a formal ball. Dress up in your finest suit or wear a black or white cocktail dress. Literally translated as rag-ball, Lumpenballs are attended by people in their shabbiest clothes. Sportlerball are Fasching balls organized by a local sport club. Skihaserlball is a Fasching party held by the local ski club. If there’s no other party theme, attendees usually dress up as a skier. Skihaserl is literally translated as ski-bunny. Most females dress up as a ski bunny. So let your artistic imagination run free. This is the female Fasching, celebrated the last Thursday before Ash Wednesday. This year, it falls on March 6. Weiberfasching starts in the morning where masked women take over cities and symbolically take the key of the town hall from the mayor. Another Weiberfasching ritual is to cut men’s ties. Men, be prepared: Don’t wear your most expensive tie. Ladies, don’t forget your scissors. The day ends with Weiber-Fasching-Parties, festivities in which men dress up as women. Some parties won’t allow men not dressed the part to enter. While men dress up as women and many women dress up as men, this is not mandatory. Women can wear any other costume, but men commonly dress as women. A traditional Bavarian Fasching in the Garmisch area with hand-carved wooden masks and live music. The masked and traditionally dressed-up Maschkeras move from place to place to celebrate traditional Bavarian Fasching. This is an outdoor event usually held in the middle of a town, market or dorf. Don’t forget to dress up warm while attending. These are the traditional battle calls of Fasching. You can here or scream it at Fasching parades, parties — wherever. “Alaaf” is used more frequently in northern Germany, while “Helau” is the right one for Bavaria. Here are some local Fasching events in the area.